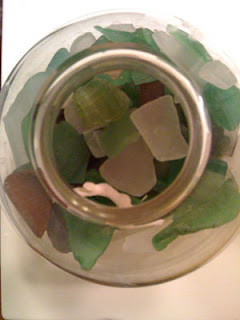 Seaglass. Shells. Bleach-white coral branches. Treasures under your feet, gifts for dropping by. In far-off rural Connecticut, Mom has thousands of these, sorted according to size and shape and color. Mine are in jars, in lamps, in bottles. I have a table scattered with sea-worn conchs on my back deck. I can't sit down without handling one. I pick through shells within reach. Wonder what beach, where. Sometimes I know - the ones on the plate, by my sink in my bathroom are from Thailand, and Scotland. Reminders that I have traveled, that I will travel. The tides ebb and flow and the bigness reassures. The view changes by sea, by vantage point, and by season. Sometimes silver, gray, black, and every shade of blue and green. Those tides transform the sharp, dangerous, glinting bits of broken. The rougher the tides, the sooner the patient work is done. Tumbling across the ocean floor, glass shards are blunted and matted. Bright, flashing threatening - they become soft. Harder to see. Jewel-like and gentle. The ocean is the only place that soothes my sharper edges, too. 'Place' is so general that I am not entirely discouraged. This 'place' that spans the periphery. A 'there' that can be hundreds, thousands, tens of thousands of miles away. For shorter, luckier spans, it is the distance of a bike ride, or a window. I lived near the beach as kid - from 11 to 19. I snorkeled and was mesmerized at the bright, busy world out of view. Each date ended with a walk on the beach, at my insistence. My nervous chatter would cease, and I could affect stillness. Mom bought time shares, and almost all time was spent on beach vacations. Different beaches, different weeks. An investment that made sense - that bought us ocean views, salt, sea glass, shells. Back home, I kept a towel in my trunk. I would sometimes go after school, after band, and watch the sun set, alone - when I did so little alone by choice back then. Dateless nights, Tica and I would get ice cream and walk - and chat, and sit. As an adult, we lived as a family, for four years, a few miles from the beach, a few years back. I could raise my head and smell salt on the air. I could breathe it, thick, on hot days. Closer in, I could taste it on my tongue, on my skin. I could brush the sand out of toddlers' hair. Slather sun protection onto fat little legs. Dig holes, bury limbs, watch kite surfers, envy sandpipers their quick feet. With Jim and Lisa, we rode tentatively or enthusiastically on the back of the waverunner - exploring further. Visiting sea turtles and dolphins. Learning, intimately, the limits of the waves. My pinkest, blondest, busiest baby was born a few miles from the ocean. His arrival meant tents and layers and lotions and pack-n-plays. Unwieldy things that interrupted my fandango notion of what beach visits were "supposed" to be. We hauled stuff, set up camp, chased and watched, slathered and brushed off. Baby powder removes sand from chubby thighs, and even the most stubborn baby only eats a full handful of sand once or twice. We would move him under the umbrella, under the umbrella, under the umbrella - hand him trucks and shovels and grovel for him to STAY under the umbrella. Stillness was not a part. We went on dates, some, the Big One and I. And like their precursors years before, those dates ended looking at the ocean. We would sit in commandeered lounge chairs, or I would lean against his sturdy, anchored frame. The top of the sand still warm from the day, toes digging to cooler layers. We would solve things. Or forget there were things to solve. Feeling shardy of late. I could use some softening - some wave-tumbles, a dose of salt, some sand for my edges.